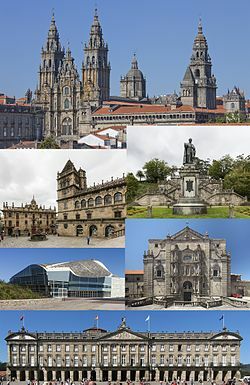 Santiago de Compostela (also Saint James of Compostela) is the capital of the autonomous community of Galicia. It is a United Nations Educational, Scientific and Cultural Organization (UNESCO) World Heritage Site. 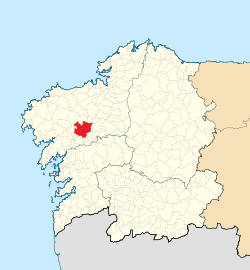 The city is in the northwest of Spain in the Province of A Coruña. The city's Cathedral is the destination of an important pilgrimage route, the Way of St. James (Galician: Camiño de Santiago, Spanish: Camino de Santiago). Pilgrims have been following this route since the ninth century. The cathedral is believed to be where James, son of Zebedee is buried. Saint James was one of the apostles of Jesus Christ. This page was last changed on 20 November 2016, at 13:31.